Schisandra, Schizandrra chinensis, is utilised in Chinese medicine as an immune enhancing herb and to treat nervous conditions. Sometimes referred to as “Chinese Prozac”. Folk use as an aphrodisiac. Schisandra is native to Korea, Manchuria, northeastern China and Japan. Prefers well drained soils in a protected, part-shaded position. Fragrant pink and white flowers give way to bright red fruit. Drought and frost resistant. A perennial, deciduous, woody vine, growing to 8m. 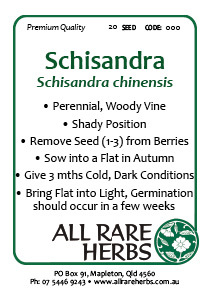 Be the first to review “Schisandra, seed” Click here to cancel reply.